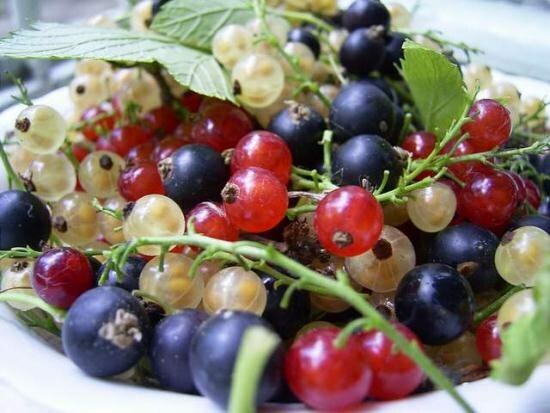 Currant – tasty and useful berry, ripe in July. It is possible to make a great compote, marmalade, jam and more. It is very important to gather this berry in particular. To collect currants, use boxes or lots of volume to four liters. If your site is a currant of different types, you must first collect the black and white because the brush of red currants unable much longer to stay in the bushes, not showering. Berries any kind of berries should be collected when ripe, greenish shades should completely disappear from painting. Black currants can be put together in certain berries and tassels, as it is not always large bunches ripen at the same time. But the white and red currants is better to collect twigs. The fact that the skins of the berries these kinds of currants are much thinner, and thus easier to crush, collecting one at a time. The berries in the freezer is best to lay packages "for one pot of compote". This practice greatly simplifies life further cooking. If you are going to collect berries for transportation and want them to Mature in ways, it is possible to collect dense do not end up painted in the main color of the fruits, however, green in color still shouldn't be. Full colouring and ripening occurs in transit, however, it should not last more than a week. The uniformity of ripening of berries on a vine depends on how long was flowering. If it is too long, the fruit will ripen at different times. To neutralize the effects of the long flowering, make sure that the lighting of the berries at the stage of ripening was uniform and relatively intense. The black currant requires slow thawing to preserve the taste. So it is not necessary to scald it with boiling water. Within two weeks you can store in the fridge black currants without the actual loss of useful qualities. Red and white currants can be stored for two months at high humidity and a temperature of about one degree Celsius. Do not wash the berries before placing in the refrigerator. If the berries are for some reason turned out to be damp, dry them before placing in cold, spread a thin layer on the table. Choose the right storage container of berries - currants need to breathe. Without loss of useful properties of black and red currants can be stored in the freezer up to three months. After this wonderful black currant flavor is preserved, but the vitamins, alas, destroyed. Lay the berries in the freezer is best iced.